Based around Exodus 20: 1-17, John 2.13-22. I don’t think I have ever preached on the Ten Commandments before. I must admit my first thought was somewhat dismissive – “we all know the Ten Commandments so nothing much there of interest”. But then I looked into it a bit more and found there were more points of interest that I’d thought. For one thing I learned that the way the verses in this passage have been divided up into Ten Commandments have in fact not always been the same. Some are obvious – e.g. You shall not steal, but some of the other verses are less clear. 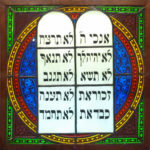 Today I would like to look at just two of the Commandments. First, “Remember the Sabbath day and keep it holy”. The people were told to have a rest day every seventh day – and it was a rest day for everyone, including children, slaves, foreigners and even animals. This is quite a radical idea – and we could regard it as some of the earliest animal rights law in the world! Even today there are places where campaigners are trying to get proper rest and refreshment for working animals. The Sabbath commandment is not just for those who want a day of religious observance – it is about rest and compassion for all members of the community and for animals. The interpretation of rest on the Sabbath has varied down the years throughout history and some Orthodox Jews still keep very strict rules on what can and cannot be done on the Sabbath. Jesus did not take this strict approach to the Sabbath but rather a more pragmatic approach. He did not condemn his disciples when they rubbed grains of corn to eat on the Sabbath even though some people thought he should. And Jesus even healed on the Sabbath, arguing that people would rescue a trapped animal or take a beast to water on the Sabbath and so it would be just as appropriate to set someone free from sickness. Jesus’ attitude to the Sabbath is summed up in Mark’s Gospel where he says, “The Sabbath is made for people, not people for the Sabbath.” In other words it is not about forcing yourself into conforming to a set of rules but about observing a rest day for the welfare of all people – and even their animals. The second commandment I want to look at is the last one, “You shall not covet your neighbour’s house; you shall not covet your neighbour’s wife or male or female slave, or ox or donkey or anything that belongs to your neighbour.” An interesting point about this commandment is that it relates to a thought, an attitude of heart rather than an action. That is quite a sophisticated idea in social and legal terms. To covet is, in the dictionary,to “desire eagerly” – but with the rider that it is usually to desire eagerly something that belongs to someone else. And therein is the problem, because desiring eagerly what belongs to someone else can lead to envy, jealousy and even to theft or adultery or even murder. A good example from the Old Testament is King David who saw Bathsheba, Uriah’s wife, and coveted her. He committed adultery with her and when she became pregnant he tried to cover it up by summoning Uriah back from the army. But Uriah refused to spend time at home while his colleagues were away at war, so David commanded that Uriah be sent to the thickest of the fighting to ensure that he would be killed – in effect murdered by David. David’s coveting of Bathsheba led to adultery and then murder. Nathan the prophet took David to task for his behaviour and expressed God’s displeasure at his actions. David repented – but the damage had been done. The story of David has a contemporary feel in that our newspapers are full every day of stories of people behaving in terrible ways because they covet things or people. Victims are robbed, defrauded, attacked and even murdered because someone covets their belongings, their money, their lifestyle, their looks … and the pain and heartache of broken relationships caused by people coveting other people’s spouses or partners and acting on their desires, is incalculable. Youngsters are mugged for high end phones or trainers or other items, because the thieves covet these goods. Elderly people have their savings stolen by people who covet money and the good life they feel it will bring. Fraudsters target people with pension funds because they covet wealth they have not earned. The other year a man died when thieves stealing his car from his drive ran him over – and all because they coveted his vehicle. People covet the lifestyle, the looks, the clothes of celebrities and see them everyday on social media. And even if they do not get into crime because of their coveting, they may get into debt trying to satisfy their desires. Apparently in China, people will spend thousands of pounds on plastic surgery so that their selfies will be “perfect” – they covet a perfect self portrait. And there is the acronym FOMO – fear of missing out, as people are desperate not to miss out on experiences or events or belongings that they believe everyone else is enjoying. But coveting can be, and often is, based on a lie – that somehow everyone else’s life is better, more exciting. If only I can have these goods, that look, a big enough bank balance, my life will be what I think other people’s lives are. I will find the satisfaction I lack. But always thinking the grass is greener on the other side of the fence is a way of avoiding tending the lawn on this side. Coveting what others have can be a way of avoiding discovering your own talents, strengths and uniqueness or cultivating the garden of your heart. So much of our society is driven by encouraging us to want things. The advertising industry is based on encouraging us to want things. The credit card industry invented the slogan, “Take the waiting out of wanting”. And as people are encouraged to want and to expect instant gratification, the pleasures of anticipation and saving up for something are lost. Craving instant gratification makes coveting so dangerous – how can I get what I covet now? The desire, the thought, can drive the action that can lead to crime, or destructive behaviour, and people can lose sight of their true selves. In Lent we reflect on what can bring us closer to God. We can look again at some of these texts, like the Ten Commandments, that we think we know so well and see what they can say anew to us in this day and age. In a world where people seem to be constantly driven we can model and promote the ideal of regular rest. Perhaps we need to heed that ourselves as we can find our rest time taken up with work for the church. We all need to rest to live well and have time to know God and so we need to find a good balance between activity and rest. In a world where social media and advertising seem to be driving more and more wanting, more and more coveting, we can perhaps show that things and looks and appearances are not what life is about. Life is about who we are as people on the inside and especially as people who know we are loved by God just as we are – imperfections and all. Who we are in ourselves is more important than what we have and tending the garden of our hearts gives us the base to reach out to others. This week’s bad weather has brought much difficulty to many but it has also brought out many good things in people and communities. Villagers have provided food and drink and safe space to people who have been stranded. Strangers have reached out to others in need. We have seen much good as people have pulled together in difficult circumstances. May we nurture this concern for our neighbours and seek to find ways to carry it on as we return to ordinary times.